At Honours, our specialty is creating custom golf packages which offer an exceptional golf experience for a remarkable value. 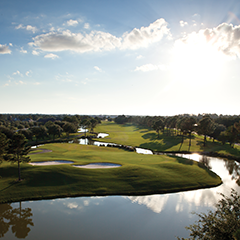 Our guest vacation services experts have local expertise and knowledge to help match your group’s style and preferences along with your budget to create the ultimate golf package. We also offer a variety of packages that will accommodate most budgets and sizes - groups large and small. Most importantly, we will save you time, money and the hassle of creating your own golf packages. Call (251) 968-5339 to book your trip today!